Open your web browser and navigate to the login URL that was provided in the licensing email. Enter your User Name and Password as requested. If you’re the first Org. Admin., use the User Name and Password that was provided to you by CommonLook. If you’re an Org. Admin. or an App. User who was added by the “original” Org. Admin., then they should have provided you with a User Name and Password. Once you’re logged in, you’ll be taken to the Dashboard screen which provides a quick snapshot of your organization’s PDF accessibility test results. Note: If this is your first time logging into Clarity, or if Widgets haven’t been created yet, there won’t be anything displayed on the Dashboard. In the toolbar, select the Domains tab, go to the Domains screen, and create a domain. Follow this link for more information about the Domains screen. In the toolbar, select the Tasks tab, go to the Tasks screen, create and run a task. Follow this link for more information about the Tasks screen. You can return to the Dashboard later by choosing that button on the toolbar. If you’re the first Super. Admin., use the User Name and Password that was provided to you by CommonLook. If you’re a “secondary” Super Admin, an Org. Admin., or an App. User who was added by the “original” Super. Admin., then the “original” Super Admin. should have provided you with a User Name and Password. Super Administrators will be taken to the Change Database screen and asked to select (or create) a Database. Here is a link to more information about the Change Database screen (on the Administration tab’s page). 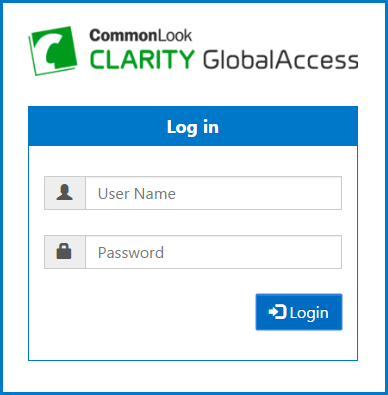 Important: If this is your first time logging into Clarity, you’ll need to Create a Database. Organizational Administrators and/or Application Users will be taken to the Dashboard screen. When Domains have been created and scans have been run, the Dashboard gives you a quick snapshot of your organization’s PDF accessibility test results. Follow this link to learn more about the Dashboard. To setup Domains, run Tasks, view Reports, or use the other features available in CommonLook Clarity, choose the appropriate tab in the toolbar. Setup or view your Domains.